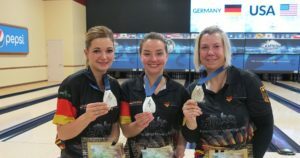 Team USA’s Shannon O’Keefe, Danielle McEwan and Kelly Kulick defeated Janine Gabel, Tina Hulsch (below left) and Patricia Luoto of Germany in the title match in women’s trios Sunday morning at South Point Bowling Plaza in Las Vegas to capture the gold medal. 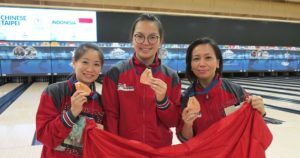 It was the second gold medal for the U.S. women’s team and the third overall in the 2017 World Bowling Championships for men and women. 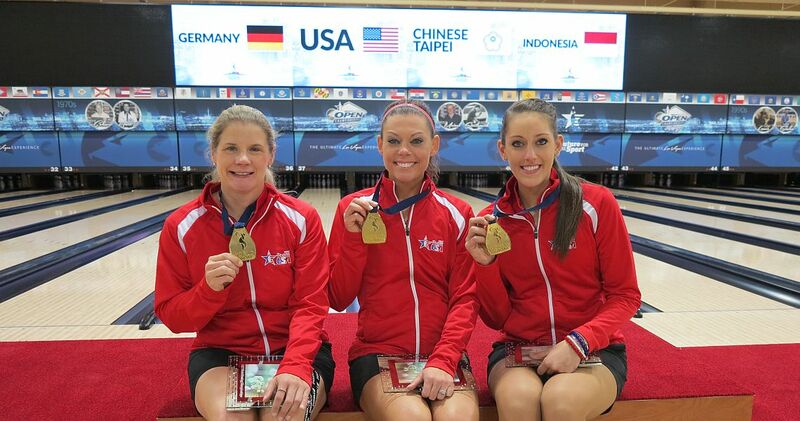 In their semifinal match, the top-seeded Americans ousted no. 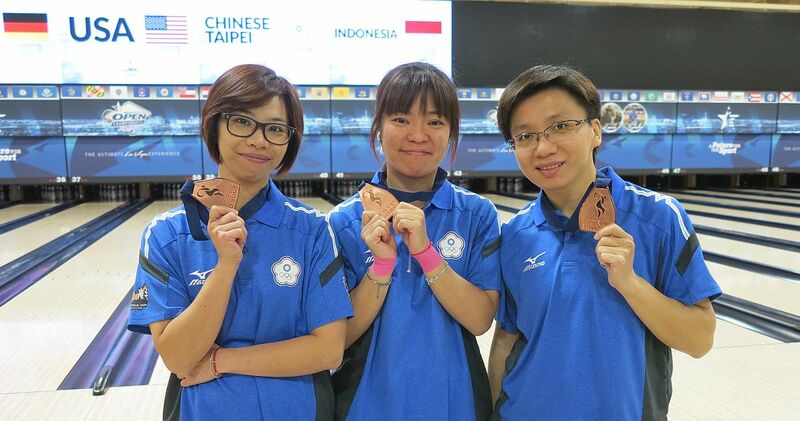 4 Indonesia with Putty Armein, Sharon Limansantoso and Tannya Roumimper (right), 663-610. The Germans, seeded second, used another 582 game to eliminated Chinese Taipei’s Su Shu-Wen, Pan Yu-Fen and Chou Chia-Chen (left), who had 560. 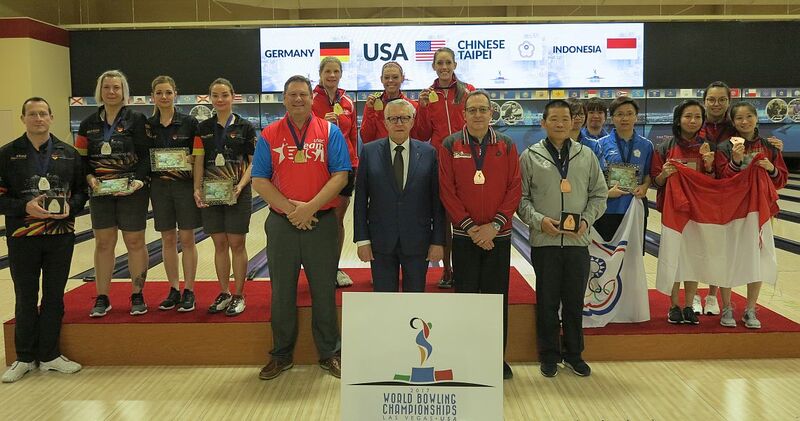 Germany earned the silver medal, while Indonesia and Chinese Taipei both got bronze. 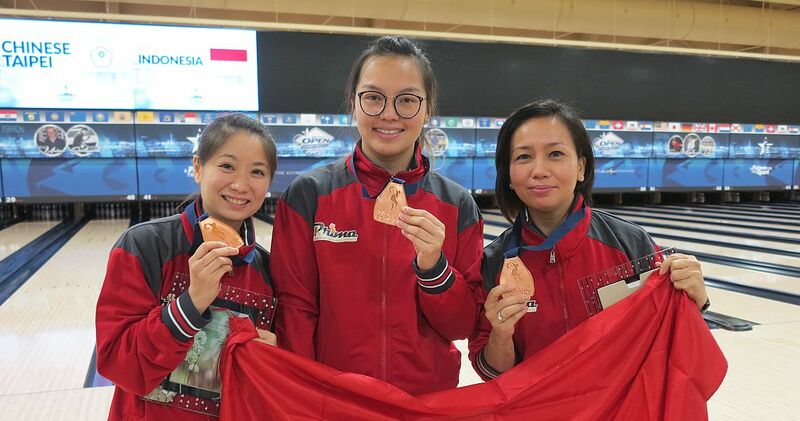 The World Bowling Championships for men and women will be held from Nov. 25 through Dec. 4 at South Point Bowling Plaza in Las Vegas, Nevada, United States. The Championships will award medals in six disciplines in each division – singles, doubles, trios, team, all-events and masters. Bowlingdigital will provide onsite coverage of the combined World Championships including reports, photos and results after each round commencing with women’s singles preliminaries on Saturday, Nov. 25, all the way through to masters match play on Monday, Dec. 4, completed in the late afternoon. Semifinal Match 1: No. 1 O’Keefe (205), McEwan (212), Kulick (246) def. Semifinal Match 2: No. 2 Gabel (184), Hulsch (192), Luoto (206) def. Championship Match: O’Keefe (238), McEwan (181), Kulick (191) def. Gabel (203), Hulsch (184), Luoto (195), 611-582.